Omega Machine sells transmission hard parts for several different types of transmissions. A short list of transmission hard parts would include bell housings and cases for the A4LD - 5R55E transmission, forward drums for the 4L80E transmission, planets for the AW55-50/51SN transmission and pumps for the 700R4/4L60E transmissions. A complete list appears below or you can sort by manufacture in the drop down box at right to narrow down your search. 200R4 Pump Line bore converter pump bushing, and new pump kit. 4L60E Pump line-bore converter pump bushing, re-machined gear cavity and mating surfaces, seals and bushings, and new pump kit. 4L80E/4L80EHD New / remanufactured. New oversized gears, re-machined gear cavity and mating surfaces, seals and bushings. 700 Stator R & R only. 700R4 (87-1/2) Pump line-bored converter bushing, re-machined gear cavity and mating surfaces, seals and bushings. New pump kit. 700R4 Small shaft line-bored converter bushing, re-machined gear cavity and mating surfaces, seals and bushings. New pump kit. 700R4 Large shaft line-bored converter bushing, re-machined gear cavity and mating surfaces, seals and bushings. New pump kit. E40D Remanufactured with larger pump gears. Update lube passages. ZF 4HP 22 Pump body rebush and new seal. ZF 4HP 18 86-Up Saab 9000 stator. Machine, resleeved with bronze. 413-470-670 Differential carriers, with bearings and races. No spider gears. 440 Driven sprocket support- Modified for new sealing rings. AXOD/E chain cover with chrome-moly sleeve. 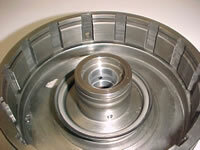 404-413-470-670 Rear planetary gear repair: Machine washer surface to fit supplied thrust bearing. 73221 E4OD center support kit with rear case bushing. Extension housing bushings for any transmission, custom made. N/P208 front yoke. Sleeved with chrome-moly. Retip main and input shafts. Check our great price on ten or more.
. AODE / 4R70W Pump remanufactured with oversize new gears. Remachined gear cavity and mating surfaces. 46001 180 Pump, re-machine pump cavity and mating surfaces. New bushings. These units are used most often in Post Office vehicles. If you have the Post Office repair contract, contact us for more information about other TH180 parts and services. 73015 4R100 Remanufactured pumps. These are complete pumps with new 9 lobe Hi Volume gears, bushings and seals. We also carry remanufactured pump bodies and gears. 66224 A4LD center supports. These are remanufactured supports using a steel sleeve to repair the area where they ring cut. Very reasonable! 35034 AXODE/AX4N new pump cover. This cover is strengthened by adding ribs and more material to body of the cover to prevent it from flexing under heavy loads.
. Repair bearing bores in Honda cases. Out of round or worn bearing bores can cause noise or broken gear trains. R & R Subaru throwout bearing repair. Sleeve split case housing.
. The AW55-50&51SN transmissions are used in Nissan, Volvos, Saturns, Maximas, and Saabs and are spitting the planetary bushings out of the planets. One of the reasons this is happening is because of wear in the Aisin Warner cases. The bore for the outer race for the drive gear becomes worn and allows excessive movement in the gear train. We repair the case with a steel sleeve back to original dimensions. 31255 AW55-50SN planetary with a one piece bushing. The stock planet has two bushings. We machine the planet for our one piece bushing. The AW55-50&51SN transmissions are used in Nissan, Volvos, Saturns, Maximas, and Saabs. This planetary has a 1.860" hole on the back side where the sun gear goes through. 44255 AW55-50SN planetary with a one piece bushing. The stock planet has two bushings. We machine the planet for our one piece bushing. The AW55-50&51SN transmissions are used in Nissan, Volvos, Saturns, Maximas, and Saabs. This planetary has a 1.765" hole on the back side where the sun gear goes through.